Lung cancer is considered as the most common malignant tumors in the medical field. However, due to its complex biological characteristics and high degree of malignancy, most lung cancer patients are found advanced stage when diagnosed and can only take palliative treatment to prolong their life span and improve their life quality. Since the strong side effects of the traditional treatments like chemotherapy prevent the elderly or physically weak patients to take the continuous treatments. However, with the development of the minimally invasive treatments and the accumulation of clinical experience, minimally invasive treatment has become a more and more important method for malignant tumors. In the late 80s of 20th century, the medical researchers proposed and then applied the 125I seeds implantation percutaneously to treat lung cancer under the guidance of CT scan, which achieved efficient control for the certain lesion. How does 125I seed work? Radioactive 125I seeds implantation for lung cancer is a minimally invasive treatment belongs to the field of short range radioactive therapy. By giving off continuous and effective Y-ray to destroy tumor cells’ DNA strand, 125I seeds deprive most cancer cells of proliferation thus to kill the cancer cells and control their repopulation or repair. At present, 125I seeds implantation has become the standard method to treat cancer and its treatment principle is well recognized gradually. Early in 2001, our country has practiced the first seed implantation surgery. Seed implantation, belongs to the field of short range radioactive therapies, has become the new choice for cancer treatment with precise effects. By implanting to the tumor or the involved tissue, 125I seeds can give off continuous and low energy rays to kill tumor without hurting the surrounding healthy tissue. Based on the treatment plan by TPS, 125I seeds implantation under the guidance of CT scan is a new technology for cancer treatment with high conformal and high dose in target area to remarkably improve the treatment accuracy. With the rapid development of modern imaging, physics of radiation and the computer treatment planning system, evaluation system, and 125I seeds implantation treatment technology has the chance to get improved. More and more reports both domestic and overseas have showed that this new treatment has the advantages of good control to local lesion, relieving patients’ symptoms in short time, improving patients’ life quality and reducing side effects. Therefore it becomes another important method to treat lung cancer. According to the experts of Modern Cancer Hospital Guangzhou, the percutaneously implanted 125I seeds to treat lung cancer have below advantages: better control the local lesion; effectively relieve patients’ clinical symptoms and improve patients’ life quality; it brings little trauma to the healthy tissue after implanted as the radioactive diameter of 125I seeds is only 1.7CM; it belongs to the minimally invasive treatments which has little complication. To treat cancer should be a comprehensive treatment process as any single treatment cannot achieve a satisfied effects, so does 125I seeds implantation. Which also been widely reported and proved both domestically and overseas. 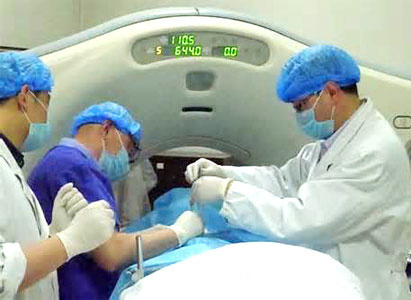 For the large size tumor, in Modern Cancer Hospital Guangzhou, experts firstly practice interventional therapy and it clinically proves that if the interventional therapy combines with seeds implantation, it can create high concentration of chemo medicine in the lung cancer tumor area, thus to achieve better results with less side effects. Or it can firstly practice cryotherapy, which can reduce the tumor size to the subclinical condition and then combine with seeds implantation to better control the local lesion and reduce the usage of seeds. This comprehensive therapy can effectively improve the patients’ life quality. In summary, 125I seeds implantation will provide another option for lung cancer treatment. With the further research and improvement of computer positioning skill as well as the Implantable Medical Device, comprehensive therapy for lung cancer will get better treatment effects because of the involvement of 125I seeds.